Warmth. Wind. Dancing blue waters, and the sound of waves. I see, hear, feel them all still. I even taste the sting of the salt against my lips, where the fine, misty spray coats them. And closer even than that, the lulling, drowsy smell of my mother’s skin by my nose, where she holds me against her bosom, her hand making a sunshade across my forehead to shield my eyes. The boat is rocking gently, and my mother is rocking me as well, so I sway to a double rhythm. It makes me very sleepy, and the sloshing of the water all around me makes a blanket of sound, wrapping me securely. I am held safely, cradled in love and watchfulness. I remember. I remember. . .
And then . . . the memory is torn apart, upended, overturned, as the boat must have been. My mother gone, and I tumbling through the air, caught by other arms, rough ones that grip so hard around my middle that I can hardly breathe. And the splashing . . . I can still hear the splashing, hear the brief, surprised cries. They say I could not possibly, that I was not yet three years old when my mother drowned in the harbor, terrible accident, and on such a calm day, how did it ever happen? was the boat tampered with? did someone push? no, she just tripped and fell in while trying to stand up, and you know she couldn’t swim, no, we didn’t know that, until it was too late, why then did she go out on the water so often? She liked it, poor soul, poor Queen, liked the sound and the colors . . .
A bright blue ball seems to envelop all that terror, that thrashing and the arcs of water flying all over, a sweeping circle, and the screams of the ladies on the boat. They say that someone dived over to help and was dragged down, too, and that two died instead of one. They also say that I clawed and kicked and tried to fling myself after my mother, screaming in fear and loss, but my strong-armed nurse, who had caught me, held me fast. I remember being pushed onto my back and being held flat, staring up at the underside of a canopy where dazzling blue water was reflected, and unable to throw off my captor’s hands. No one comforts me, as one would expect someone to do for a frightened child. They are too concerned with preventing me from escaping. They say I cannot remember that either, but I do. How exposed I feel, how naked on that boat bench, torn from my mother’s arms and now forcibly held down, as the boat hurries for shore. Some days later I am taken to a large, echoing room, where light seems to come in from all sides and wind sweeps through, too. It is a room, but it feels as if it is also outdoors–a special sort of room, the room for someone who is not a person but a god. It is the temple of Isis, and the nurse is leading me to a huge statue-pulling me, rather. I remember digging in my heels and having to be almost dragged across the shiny stone floor. The base of the statue is enormous. I can barely see over the top of it, to where two white feet seem to be, and a figure standing above it. The face is lost in shadow. “Put your flowers at her feet,” the nurse is saying, tugging at my fist with the flowers I am clutching. I don’t want to let go of them, don’t want to put them there. Is she? I try to see the face, but it is so high and far away. It does not look like my mother’s face. “Give her the flowers,” the nurse prompts. Slowly I lift my hand and put my little offering on the pedestal at the end of my reach. I look up again, hoping to see the statue smile, and I imagine that I do. So, Isis, it is thus, and on that day, I became your daughter. 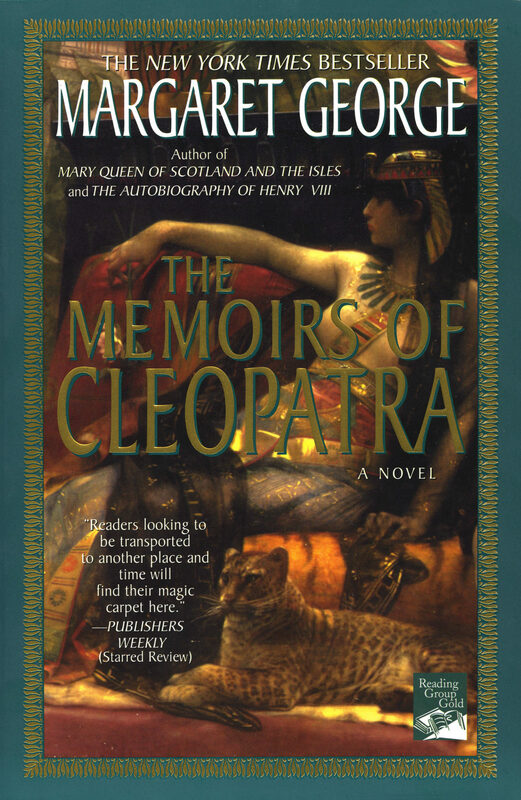 My mother the late Queen’s name was Cleopatra, and I was proud to bear her name. But I would have been proud of it in any case, for it is a great name in the history of our family, going all the way back to the sister of Alexander the Great, to whom we Ptolemies are related. It means “Glory to her Ancestry,” and all my life and reign I have tried to fulfill that promise. All that I have done, I have done to preserve my heritage and Egypt. All the women in our line were named Cleopatra, Berenice, or Arsinoe. Those names, too, went all the way back to Macedonia, where our family had its origins. Thus my two older sisters received the names of Cleopatra (yes, there were two of us) and Berenice, and my younger sister the name of Arsinoe. Younger sister . . . there were others after me. For the King needed to marry again, and soon after the untimely death of his Queen Cleopatra, he took a new wife, and she straightway produced my sister Arsinoe. Later she gave birth to the two little boys to whom I was briefly “married.” Then she died, leaving Father a widower again. This time he did not remarry. I did not care for my father’s new wife, nor for my sister Arsinoe, who was only a little more than three years younger than I. From her earliest days she was sly and deceitful, a whiner and complainer. It did not help that she was also quite beautiful-the kind of child that everyone exclaims over, and asks, “And where did she come by those eyes?” and not merely out of politeness. It gave her an arrogance from the cradle, as she saw it not as a gift to be appreciated but as a power to be used. My sister Cleopatra was some ten years older than I, and Berenice eight. Fortunate sisters, to have had our mother for that many years longer than I! Not that they seemed to be grateful for it. The eldest was a dour, drooping sort of creature; I fear I cannot even recall her very well. And Bereniceshe was a veritable bull of a woman, big-shouldered, raw-voiced, with wide, flat feet that made even normal walking sound like stamping. There was nothing about her to recall our ancestor, the delicate-featured Berenice II, who had reigned with Ptolemy III two hundred years earlier and passed into legend as a strong-willed beauty to whom court poets dedicated their works. No, the red-faced, snorting Berenice would never inspire such literary outpourings. I basked in the knowledge that I was my father’s favorite. Do not ask me how children know these things, but they do, no matter how well parents try to hide it. 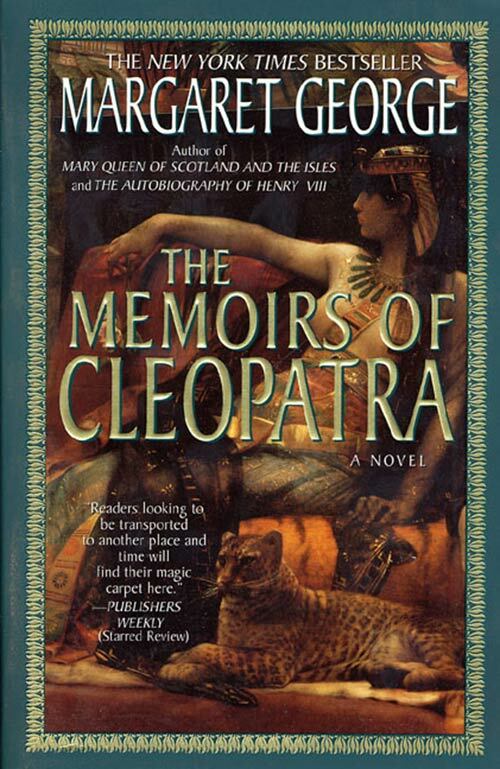 Perhaps it was because I found the other Cleopatra and Berenice to be so peculiar that I could not imagine anyone being partial to them rather than to me. But later, even after Arsinoe with all her beauty came along, I retained the leading place in my father’s heart. I know now it was because I was the only one who showed any concern for him in return. I must admit it, honestly but with reluctance: The rest of the world (including his own children) found Father either comical or pitiful-perhaps both. He was a handsome, slight man, with a diffident and dreamy manner that could turn quickly to nervousness when he felt threatened. People blamed him both for what he himself was-an artist by inclination, a flute player, and a dancer-and for the situation he had inherited. The first was his own doing, but the second was an unfortunate legacy. It was not his fault that by the time he managed to climb onto the throne, it was practically in the jaws of Rome, necessitating any number of undignified postures to retain it. These included groveling, flattering, jettisoning his brother, paying colossal bribes, and entertaining the hated potential conquerors at his very court. It did not make him loved. Nor did it make him secure. Was it any wonder that he sought escape with the wine and music of Dionysus, his patron god? But the more he sought it, the more disdain he reaped. Father’s Magnificent Banquet for Pompey the Great: I was almost seven then, and eager finally to see Romans, real Romans, the Romans (that is, the dangerous ones, not the harmless merchants or scholars who showed up in Alexandria on personal business). I pestered Father to let me attend, knowing well how to persuade him, since he was susceptible to almost everything I asked, within reason. Everyone had trembled about Pompey, since he had just swooped down on our part of the world. First he had put down a major rebellion in Pontus, then he had continued into Syria and taken the remnants of the empire of the Seleucids, turning it into a Roman province. A Roman province. The whole world was turning into a Roman province, so it seemed. For a long time, Rome-which was located far away, on the other side of the Mediterranean-had confined itself to its own area. Then gradually it had extended its grasp in all directions, like the arms of an octopus. It grabbed Spain to the west, and Carthage to the south, and then Greece to the east, swelling and swelling. And the larger it swelled, the more its appetite grew to feed its bulk. Little kingdoms were just morsels to it-tidbits like Pergamon and Caria, easily swallowed. The ancient realms of Alexander would be more satisfying, stave off its hunger better. Once there had been three kingdoms carved out of Alexander’s domains, ruled by his three generals and their descendants: Macedonia, Syria, and Egypt. Then two. Then Syria fell and there was only one: Egypt. There were reports that the Romans now felt the time was ripe to annex Egypt as well, and that Pompey himself was particularly keen on it. So Father had decided to do everything in his power to buy Pompey off. He sent cavalry units to help Pompey in crushing his next victim, our nearest neighbor, Judaea. Yes, it was shameful. I admit it. No wonder his own people hated him. But would they rather have fallen to the Romans? His choices were those of a desperate man, between bad and worse. He chose bad. Would they have preferred worse? “I want to see him,” I insisted. He looked at me oddly. Now I know it was because it was a strange way for a seven-year-old to speak, but then I was just afraid he was displeased with me and was going to refuse me permission. “We?” Surely he did not mean . . . or did he? I was only the third child, although at that point I had no brothers. “We Ptolemies,” he clarified. But he had seen the hope that had briefly flared up in me. My First Banquet: Every royal child should be required to write a rhetorical exercise with that title. For banquets play such an inordinately large part in our lives; they are the stage where we act out our reigns. You start out dazzled by them, as I was then, only to find that after a few years they all run together. But this one will remain forever engraved in my mind. There was the (soon to become dully routine) act of dressing, the first stage in the ritual. Each princess had her own wardrobe mistress, but mine was actually my old nurse, who knew little about clothes. She outfitted me in the first dress from the stack; her main concern was that it be freshly laundered and ironed, which it was. “And how is that?” I felt as encased as a mummy in its wrappings, which were also usually of linen. Perhaps going to the banquet was not such a good idea after all. “Shouldn’t I wear a diadem?” I said. “I suppose you are right.” I pretended to agree. I let her comb my hair and pull it back with a clasp. Then I said, “Now that my forehead is so bare-not even a fillet?” A small, discreet one, a narrow band-yes, that would be fine with me. I had been in the banqueting hall before, but only when it was empty. The enormous chamber, which stretched from one side to the other of a palace building (for there were many palace buildings on the royal grounds) and opened onto steps overlooking the inner harbor, had always seemed like a shiny cavern to me. Its polished floors reflected my image when I ran across it, and the rows of pillars showed me passing. High above, the ceiling was lost in shadow. But tonight . . . the cavern was ablaze with light, so much so that for the first time I could see, far above, the cedar beams overlaid with gold that ran the length of the ceiling. And the noise! ‘The sound of a crowd-which was to become so familiar to me-assaulted my ears like a blow. The whole chamber was packed with people, so many people that I could only stop and stare at them. We-the royal family-were standing at the top of a small set of steps before entering the room, and I wanted to take my father’s hand and ask him if all the thousand guests were here. But he was standing in front of me, the place beside him occupied by my stepmother, and there was no opportunity. We waited for the trumpets to sound, announcing our entrance. I watched intently, trying to see what Romans looked like. Which ones were the Romans? About half the people were wearing the common sort of loose-flowing garments, and some of those men had beards. But the others . . . they were clean-shaven, with short hair, and they were wearing either a voluminous sort of draped cape (which looked like a bedsheet to me), or else military uniforms, made up of breastplates and little skirts of leather strips. Obviously those were Romans. The others must be Egyptians and Greeks from Alexandria. The trumpets blasted, but from the other end of the hall. Father did not stir, and soon I saw why: The trumpets were heralding the entrance of Pompey and his aides. As they filed toward the center of the chamber, I beheld the full regalia of a Roman general of the highest order, in which the plain breastplate of the soldier was replaced by one of pure gold, decorated with artwork. His cloak, too, was purple, not red, and he wore some sort of special enclosed boots. It was altogether splendid to look upon. Pompey himself? I was disappointed to see that he was just a man, with a rather bland face. There was nothing about him as dazzling as his uniform. On each side of him were other officers, their faces harder and more set than his, and they served as a frame to set him apart. Now a second set of trumpets sounded, and it was our turn to descend, so that Father could greet his guests and welcome them officially. All eyes were upon him as he carefully stepped down, his royal robe trailing behind him. I made sure not to trip on it. The two men stood face-to-face; Father was so much shorter and smaller! Next to the husky Pompey, he looked almost frail. “You are most welcome to Alexandria, most noble Imperator Gnaeus Pompeius Magnus. We greet you, and salute your victories, and declare that you honor us by your presence here this evening,” said Father. He had a pleasant voice, and normally it carried well, but tonight it lacked power. He must be terribly, terribly nervous-and of course that made me nervous, too, and nervous for him as well. Pompey gave some reply, but his Greek was so accented I could hardly understand him. Perhaps Father did; at least he pretended to. More exchanges followed, many introductions on both sides. I was presented-or was Pompey presented to me? Which was the proper order?-and I smiled and nodded to him. I knew that princesses-let alone kings and queens!-never bowed to anyone else, but I hoped it would not offend him. He probably did not know all these things, being from Rome, where they had no kings. Instead of his previous response-a tepid smile-he suddenly bent down and stared right into my face, his round blue eyes just level with mine. “What an enchanting child!” he said, in that odd Greek. “Do the children of kings attend these things from the cradle?” He turned to Father, who looked embarrassed. I could tell he regretted allowing me to come; he did not wish to do anything that might call unflattering attention to us. “Not until the age of seven,” he improvised quickly. I wasn’t quite seven yet, but Pompey would never know. “We believe that that age is the portal to understanding . . . .” Tactfully he indicated that the banquet tables were waiting, in the adjoining, almost equally large, chamber, and steered the Roman commander in that direction. Beside me, my older sisters were smirking; they seemed to find my discomfiture amusing. ” `What an enchanting child,’ ” Berenice mimicked. I was surprised to see him, and I wondered why he was there. He looked completely out of place. Would Pompey stop and single him out, too? But luckily he seemed more interested in getting to the food in the next room. Everyone said Romans were most fond of eating. The boy, who was dressed as a Greek and holding the hand of a bearded, Greek-looking man, must be an Alexandrian. He was studying us the way I had studied the Romans. Perhaps we were a curiosity to him. Our family did not make many public appearances in the streets of Alexandria, for fear of riots. We walked slowly, and–I hoped–majestically past him, and entered the transformed room where we would dine. Some late afternoon rays of sun were stabbing almost horizontally across the chamber, just at the level of the tables, where a forest of gold goblets and dishes was waiting. It seemed like magic to me, lighted up like that, and it must have to the Romans, too, because they were all laughing with delight, and pointing. Pointing! How rude! But then . . . I had been warned to expect it. Pompey was not pointing, nor were his companions. He did not even look particularly interested; or if he was, he hid it well. We took our places; all the adults were to recline, while only the lesser folk would sit on stools-and there were very few lesser folk present. My nurse had told me that in Rome both women and children were relegated to the stools, but neither the Queen nor the older princesses would ever tolerate that here. I tried to figure out how many couches were needed for a thousand people to recline, and knew it was over three hundred-and yet they fitted into this enormous room, with ample room left over for the servers to pass between them easily with their trays and dishes. Father was motioning me to a stool, while Pompey and his companions spread themselves on the couches clustered for the highest of the high. Was I to be the only one on a stool? I might as well have worn a huge sign calling attention to myself. I watched while my sisters and stepmother settled themselves, daintily twitching their gowns and tucking one foot under the other. How I wished I were only a little older, and could be on a couch! I felt myself to be so conspicuous that I wondered how I would ever get through the meal. Just then Father ordered the bearded man with the boy to join us; I saw him sending for them. I knew he was doing it to alleviate my embarrassment; he was always very solicitous of others, seeming to sense their distress even if they did not voice it. The man nodded, seemingly unperturbed at being assigned to our exalted midst. He must be a philosopher; they were supposed to take all things with equanimity. And of course the beard confirmed it. He propelled his son forward, pushing him before him, and a stool was quickly brought for him. Now there were two of us. I suppose Father thought that would make it easier. Actually, it just drew more attention. And so on. The polite conversation continued. The boy by my side was silent, just looking. What was he doing here? The wine flowed, and the talking grew louder, more animated. The Romans forgot to speak Greek and lapsed back into Latin. What an odd, monotonous sound it had if you did not understand it. And I had not studied it. There was little to recommend it; nothing important was written in it, and there were no famous speeches in it. Other languages, such as Hebrew, Syriac, and Aramaic, were much more useful. And lately I had even decided to try to learn Egyptian, so that I could go anywhere in my country and understand the people. But Latin? That could wait. I watched my sisters, who were hardly bothering to hide their disdain for the Romans; when the conversation fell back into Latin, Berenice and Cleopatra just rolled their eyes. I was worried about it; what if the Romans saw them? I thought we were supposed to be careful about giving offense. Suddenly trumpets sounded and an array of servers appeared, as if from out of the walls, and snatched the gold vessels away, replacing them with more gold vessels, even more heavily engraved and jeweled than the first set. The Romans just stared-as I supposed they were meant to. But what was the point? Why was Father so anxious to show off our wealth? Would it not make them want to appropriate it? This confused me. I saw Pompey looking dreamily at the enormous cup before him, as if he were visualizing melting it down. And then I heard the word Caesar, and it was linked with something to do with greed and needing money. I thought Pompey was saying to Father-I strained very hard to overhear-that Caesar (whoever he was) had wanted to take Egypt and make it into a Roman province, since it had been willed to Rome …. Curses! Now I could not hear what Father and Pompey were saying, and it was terribly important. I tried to blank out the voice right beside me, but it was hopeless. Oh, be quiet! I ordered him in my mind. But Theophanes kept asking him questions. Did he live at the Museion, too? Was he interested in any special sort of medicine? What about pharmakon, drugs? That was a way to combine knowledge of plants and medicine. Theophanes lost his smile. “The mad honey-meli maenomenon-don’t ask Pompey about it. It grieves him still. You see, the area around the Black Sea where Mithridates held swayit’s known for its poisonous honey. Some of his allies put out combs of it near our routeour soldiers helped themselves, and we lost many. Many.” He shook his head. “But what about the bees? Does it kill them, too?” Olympos asked. “You, too, friend!” Father was wagging his finger, as if it was all just too, too funny, and not threatening at all, and Pompey his great and good comrade, instead of a vulture trying to eat us. “No, the bees are immune,” said Theophanes. “But doesn’t it look or taste different?” asked Olympos. He sounded so solemn, so professional. “Oooh.” Olympos looked impressed at last. He seemed very difficult to impress, or even ruffle. “Did you know that Xenophon’s troops fell victim to it, too? Four hundred years ago! Thousands collapsed. In the same area. We historians busy ourselves with such data,” Varro was saying. “Now that I’m here, I’d like to consult some of the scrolls in the famous Library. Where supposedly all written knowledge resides!” He shouted over at Father. “Isn’t it so? Don’t you have a half-million volumes in the Library?” he bellowed. Father broke off his conversation with Pompey-the conversation I was longing to hear, although I did find the “mad honey” interesting. But not as interesting as the will giving Egypt to Rome. Had one of our ancestors actually done that? Isis forbid! “Eh?” he said, cupping his hand over an ear. “I said, don’t you have half a million scrolls here in the Library?” yelled Varro. My sisters rolled their eyes again at more Roman boorishness. “So they say,” said Father. “Yes, we kept the originals and sent the owners away with copies!” said Father. “Ah, the glories of Alexandria,” said Pompey, considering them. He smiled. Before Pompey could reply, another blare of trumpets sounded, and the gold service was changed yet again, with much ceremonial clanging and clatter. At each round, the implements became more ornate. The eating proper could begin, and it did, with a profusion of dishes totally unfamiliar to me-certainly they were not the fare even royal children were served. Sea urchins in mint . . . baked eel in chard . . . Zeus-acorns . . . mushrooms and sweet nettles . . . Phrygian ewe’s-milk cheese . . . Rhodian raisins . . . and fat, sweet dessert grapes-along with honey-cakes. Unfortunate choice! Pompey and all the rest pushed them aside; the sight and smell of honey were not pleasing to them now. “But this is from Cos!” Father assured them, in vain. And there was wine, wine, wine, different for each food-Egyptian red and white, the famous apple-scented wine of Thasos, and, the sweetest of all, Pramnian. “It’s made from partially dried grapes,” explained Varro, smacking his lips as he downed it. “That concentrates the sweetness, so . . . ummm . . .” More lipsmacking. Since my wine was so diluted, I could barely tell the difference among all these, but I nodded anyway. Would that Father’s wine had been equally diluted! For, in his nervousness, he drained cup after cup of it, and soon was wearing a strange half-smile and leaning overfamiliarly toward Pompey. And then-I shall never forget it!he suddenly decided to call for his pipes and play. Yes! To entertain the Romans, as he said. And because he was the King, there was no one to say, No, stop it! You must not! I longed to jump up and do it, but I was frozen in my place. I had to watch while his steward brought him the pipes, and while he lurched off the couch and made his way unsteadily to an open space where he could perform. I watched in horror, acute embarrassment, and shame. The Romans were staring, dumbfounded. Father took a deep breath to fill his lungs and then started playing his melodies. Although the sound was not loud, such a deep hush fell over the entire hall that every note quavered on the air. Olympos turned and gave me a pitying look, but it was kind, not condescending. I wanted to shut my eyes and not have to behold the painful sight of the King performing like a street musician-or a monkey for its master. It was the wine that had done this! I vowed, in that instant, never to bow to wine or let it overcome me-avow I believe I have kept, although Dionysus and his grapes have caused me much grief nonetheless. Suddenly one of the Romans at another couch began guffawing, and that had a ripple effect; soon even Pompey was laughing, and then the whole hall was roaring. Poor Father took it as approval and applause for himself, and even bowed. Then-oh, the shame of it!-he executed a little dance. What had he said? You must be on your best behavior; we have to convince him that both Egypt and Rome are well served by our remaining on the throne. How could he have forgotten his own mission, and Egypt’s danger? Was wine that strong? As my father wove his way back to his place, Pompey patted the cushion, as if the King were a pet. Why was he telling me this? To make me feel worse? “I know,” I said coldly, although I did not. We have to convince him that Egypt is well served by our remaining on the throne. We Ptolemies . . .
Berenice and Older Cleopatra were just staring; there was no help from those Ptolemies, either. Why did they not do something, say something, to offset it? Tonight you must behave as a princess . . . with dignity. . . What an enchanting child . . . .
Perhaps there was something I could do, something, anything . . . . Pompey had seemed to like me, had singled me out for his attention . . . . I left the stool and walked over to him. He was leaning on one elbow, and as I came closer I could see that the wine had affected him, too. His eyes were a little unfocused, and he had a fixed smile on his face. A wide gold cuff gleamed on his forearm, and he was running his fingers over it. Thus we all rushed in to save the King-and Egypt.